Cut approximately 3 to 4 centimetres off the bottom of the stem with a clean and sharp knife or secateurs. Then place them in a vase or bucket immediately. A good display can significantly boost sales of roses. Present them by colour with other flowers - pink is a trend colour in 2019 - and make use of the luxury packaging offered by some growers in order to protect the roses while simultaneously emphasising their special status. A bit of space around the flowers literally gives the customer room to make their choice. Customers like roses in mixed bouquets (bestsellers to take away) and in mono bouquets and arrangements (for special occasions). 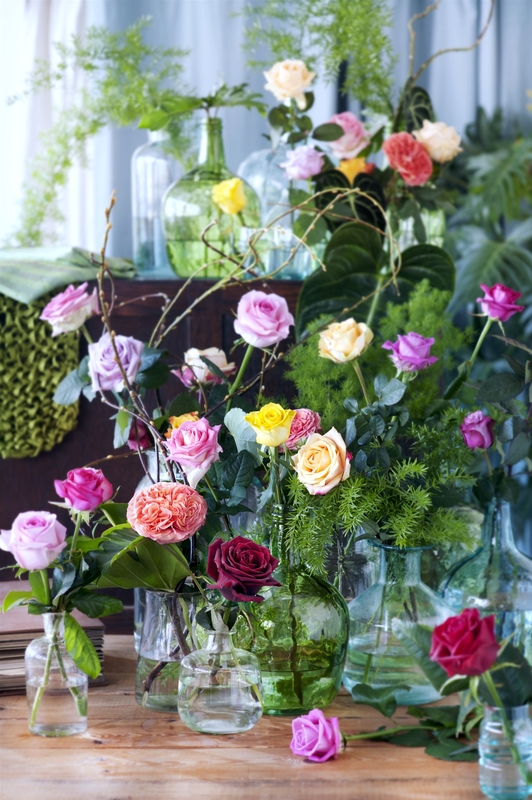 Because roses are well-known cut flowers, it can be useful to offer them in creative forms as well: floating in glass hangers on an Easter branch, cut short and divided across a collection of small vases, or as a luxury element in a field bouquet. *Place roses in a clean vase with clean water. *Add cut flower food to the water for a longer vase life. *Trim 3-5 cm off the stems diagonally with a sharp and clean knife. *If possible, leave the thorns on the stems. *Regularly top the vase up with tap water. *Do not place roses in a draught, in full sun, near a heater or beside the fruit bowl. Inspiring images of every flower on the Flower Agenda have been produced in line with the Horticulture Sector Trends 2019.